A fabulous front view of the Newark 2016 model. Christian Koehn - a luthier from Germany has been making guitars professionally since he graduated at the top of the International Guitar Making School course in 2006 in Newark at the Newark College. Interestingly, the guitar featured in this article is named after the college and area that offers the guitar making course. Koehn was the recipient of the prestigious Ashley Mark Publishing Prize for being the best of the best in his graduation class. Since that time Christian has gone on to setup his own workshop back in his birthplace - Berlin. The guitar featured in this article is a custom order. Not too much is revealed about the woods used in its construction but all I can say is that the result is breathtaking to say the least. Easy to see the headstock, soundport & beveled cutaway. An awesome view of the huge soundport. 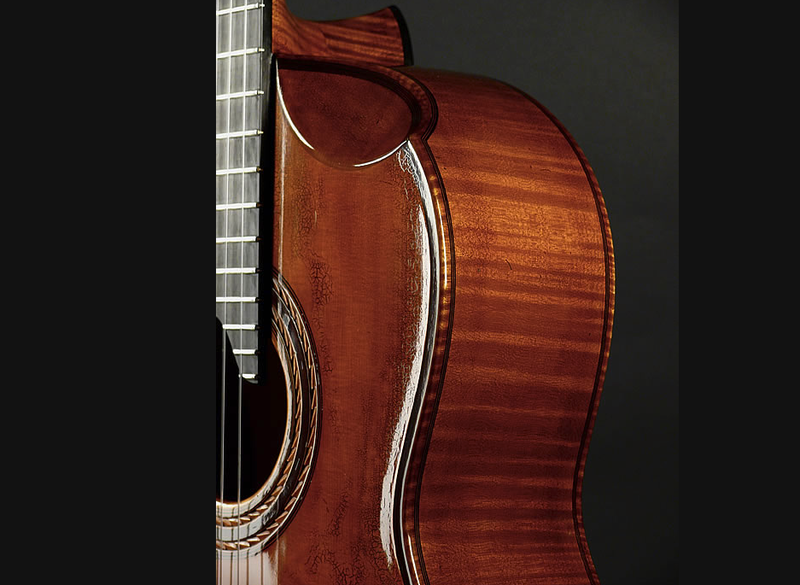 Superb look at the beveled cutaway allowing for easier playability past the 12th fret. That aged look is amazing! How to get one for yourself?!?! Christian has easy payment terms of just 10% to secure a guitar with a further 10% payable when he starts the build (30% for custom builds). Check out my other articles of beautiful & unusual classical guitars here.